A beloved stuffed animal and a child's imagination are the only ingredients needed for happiness in this delightful picture book debut. Lavender the elephant, who has a long nose for fun, drops into a child's bedroom to play. When he learns that they need to stay tidy for Mommy's afternoon tea party, Lavender suggests a leisurely stroll in the garden. But quiet activities soon escalate into a joyful mud-pie mess! Uh-oh, here comes Mommy! Clean from their baths – the child in the tub and the elephant in the washing machine – the two friends enjoy cookies at tea time. 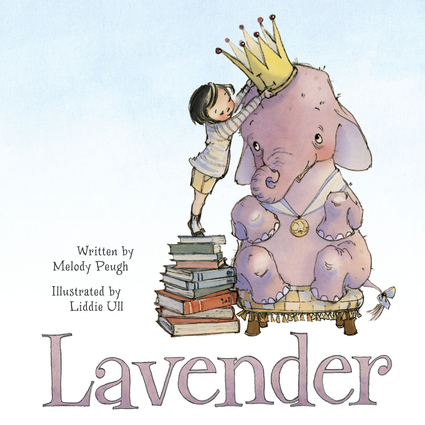 Their pachyderm play-date ends perfectly, the child dreaming about more adventures with Lavender – who was a stuffed-animal all along. Adorably narrated by the child, Melody Peugh's playful story begs to be read aloud. Its lovely lilt evokes the poems of A.A. Milne, while Liddie Ull's expressive watercolor and pen-and-ink drawings are reminiscent of Ernest Shephard's classic Winnie-the-Pooh illustrations. Melody C. Peugh (pronounced Pew) landed a job with Hallmark Cards at age 15, where she solidified her love for rhyme and writing. She went on to work as a typist at Sears Roebuck and as a legal secretary. She's been a Girl Scout leader and a 4H leader, and she has taught children's Bible classes in Colorado, Texas, and Kansas for the past 30 years. This is her first picture book. Liddie Ull has an MFA in Illustration from Syracuse University, and is fluent in traditional and digital media. She has illustrated for magazines and greeting card companies. She lives on a sanctuary farm in upstate New York which currently houses 21 pigs, a 27 year-old donkey, two horses, four goats, two ducks, one guinea hen, and a little rooster. All of these animals inspire her adorable watercolor paintings. This is her first picture book.